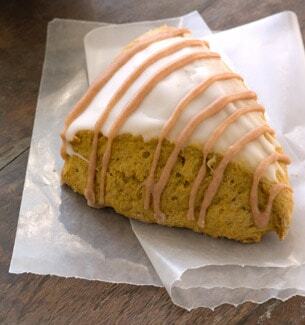 A pumpkin spiced scone dipped in white icing, accented with pumpkin icing. unbleached, enriched wheat flour (wheat flour, malted barley flour, niacin, reduced iron, thiamine mononitrate, riboflavin, folic acid), icing (sugar, water, corn syrup, fructose, contains less than 2% of the following: gum arabic, agar, potassium sorbate [preservative], citric acid, natural flavor, mono- and diglycerides, locust bean gum, cinnamon), unsalted butter (cream [from milk]), pumpkin puree, sugar, whole eggs, honey, buttermilk (from milk), soybean oil, leavening (sodium acid pyrophosphate, sodium bicarbonate, corn starch, monocalcium phosphate), soy lecithin, salt, invert syrup, vanilla extract, spices. Let’s give thanks for this delicious recipe. It's a fluffy quick bread, wrapped in a crisp, sweet glaze and accented with a decorative stripping of pumpkin icing. Way too good to save for once a year, this treat just happens to be our most popular scone. In many parts of Scotland, Wales and much of Northern England, "tea" is also a word for dinner. So scones are okay for dinner too.